Coal fired Power Station in Poland uses PennguardTM linings to protect corroded steel chimney flues while leaving old organic coating in place. Rybnik Power Station is the largest coal fired Power Station in the Upper Silesia area of southern Poland. Owned and operated by EDF Polska, Rybnik has a generating capacity of 1,775 MW (around 8% of Poland’s total energy use), spread across eight units. In 2008, two new wet limestone flue gas desulfurization (FGD) plants were constructed to treat the gas flows from four units (each 215 MW). Rybnik Power Station also installed a 120 m high concrete chimney for the FGD plants, housing two steel flues, each 6.95 m in diameter. To maximize the efficiency of the FGD plants, the owner chose to not reheat the desulphurized flue gas. Therefore the chimney operates as a “wet stack” carrying non-reheated flue gas with a temperature of 52°C. Non-reheated wet stack operation results in continuous condensate formation within the flues. To protect the steel flues against corrosion they were both lined with a sprayable organic coating. In addition, both flues were externally clad with 40 mm-thick glass wool insulation. Wet stack operation is very demanding on chimney flue lining systems however, and after some time Rybnik Power Station found that small failure spots had developed in the lining resulting in localized corrosion of the steel flues. In early 2012 the owner decided to investigate other options for lining the flues. The key selection criteria were: proven resistance to sulphuric acid condensate, reliability in a wet stack environment, and the possibility to perform installation within a limited outage. 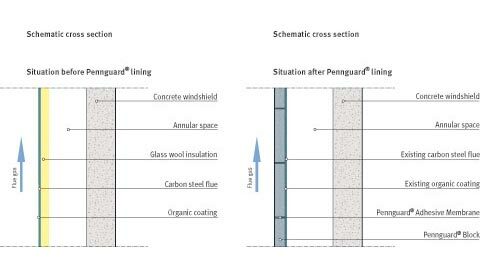 The PennguardTM Block Lining System was selected for this task. 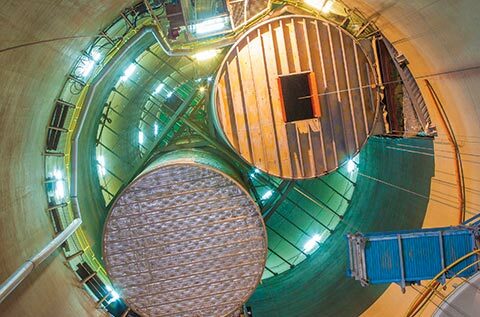 In 2012-2013 Rybnik Power Station repaired the two flues by installing PennguardTM linings directly over the existing organic coating, mostly avoiding costly and time consuming repairs to the corroded steel flues. 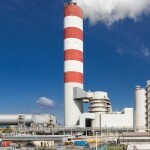 The use of FGD wet stacks helps to optimize the efficiency of coal fired units, but wet stack operation results in aggressive conditions for chimney flue linings. As shown by the case of this wet stack, even small imperfections in the lining can lead to rapid corrosion of the steel chimney flues. Once holes have occurred in the steel flues any efforts to repair the corrosion spots are time consuming and expensive. 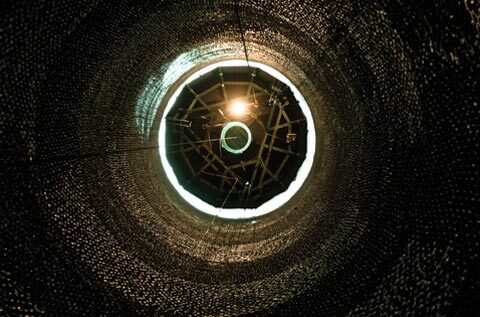 In the Rybnik Power Station chimney flues, this difficult work had to be performed by workers suspended from ropes, and it was impossible to effectively repair the extensive corrosion damage under the time pressure of short unit outages. The PennguardTM lining installations in the two flues, in 2012 and 2013, were performed successfully by Uniserv S.A., under the technical supervision of Hadek. In both flues, the work consisted of the following steps. 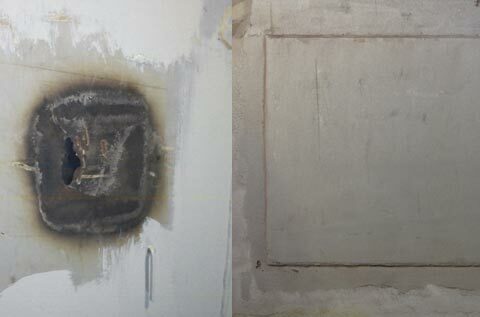 First, the external insulation was removed. The 40 mm thick layer of glass wool had become partially wetted with condensate leaking through holes in the flues, rendering it ineffective. 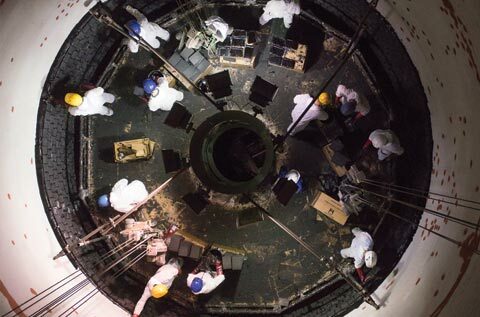 Where severe corrosion and holes had occurred, the damaged area was grit blasted and the holes were closed off by welding on appropriately sized steel plates. 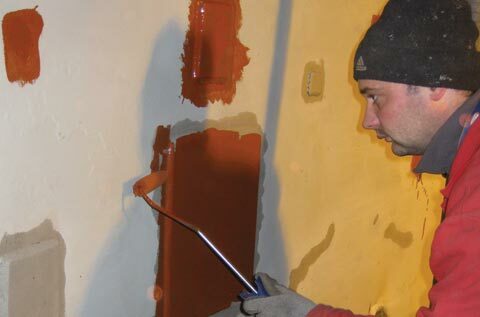 In all other areas where the organic coating was still intact, the flue surface was lightly grit blasted to clean and slightly roughen the coating surface in preparation of the installation of the PennguardTM lining. No primer was used, with the exception of the new plates and the areas around them, where the steel was hand primed using PennguardTM Block Primer. The PennguardTM lining was installed using a suspended work platform, by teams of 11 brick layers including support workers working in 2 shifts of 10 hours each. 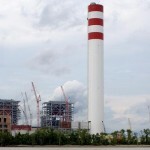 The total surface area within each flue is 1.793 m² and both flues were repaired and relined within a 36-day unit outage. The internal flues of FGD wet stacks are often externally insulated to minimize thermal losses and condensate formation within the flues. When a steel flue corrodes however, condensate may penetrate through the steel and into the thermal insulation, making it ineffective, even if it looks to be in good condition from the outside. In extreme cases, the presence of acidic condensate can cause corrosion on the outside of a steel flue, as well. 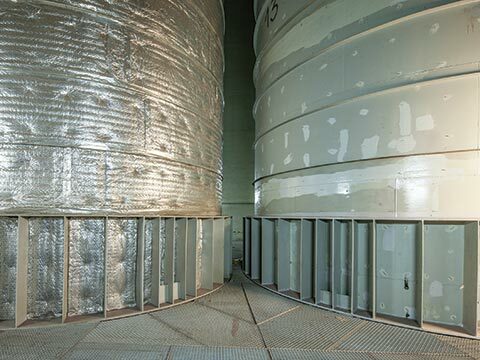 PennguardTM linings provide both corrosion protection and thermal insulation. The use of PennguardTM linings in the corroded steel flues made it possible for Rybnik Power Station to remove the glass wool insulation. This allows the external surfaces of the the steel flues to dry, eliminating the threat of external corrosion. When the first of the two flues had been lined with PennguardTM, Hadek produced a side by side thermal image of both chimney flues. 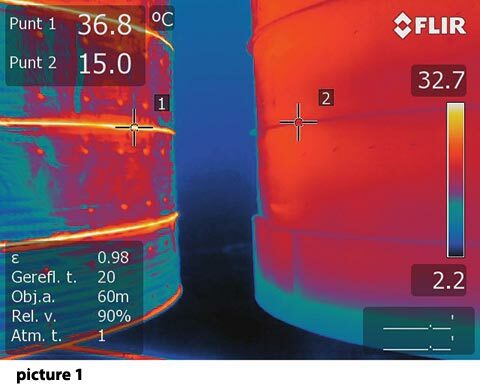 The thermal image (see picture 1) shows that the thermal profile of the non-restored flue (left) is very irregular, indicating wet thermal insulation and significant thermal losses. By contrast, the PennguardTM-lined flue (right) shows a uniform temperature all over its external surface.